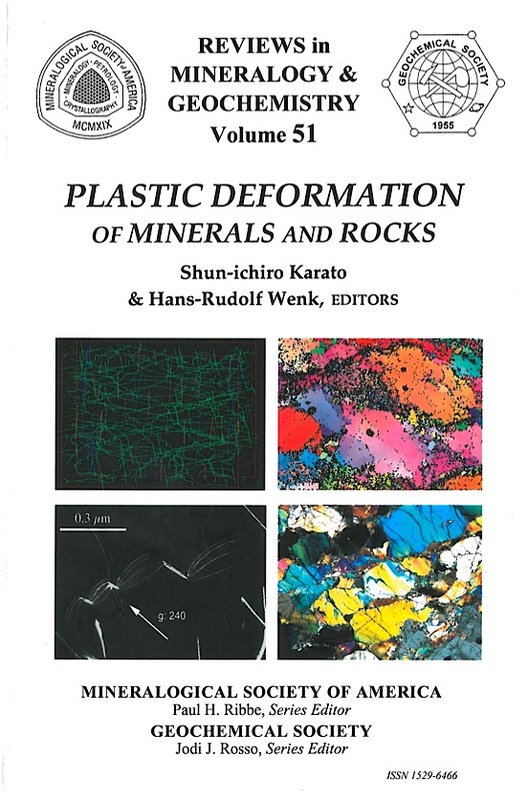 This volume highlights some of the frontiers in the study of plastic deformation of minerals and rocks. The research into the plastic properties of minerals and rocks had a major peak in late 1960s to early 1970s, largely stimulated by research in the laboratory of D. T. Griggs and his students and associates. It is the same time when the theory of plate tectonics was established and provided a first quantitative theoretical framework for understanding geological processes. The theory of plate tectonics stimulated the study of deformation properties of Earth materials, both in the brittle and the ductile regimes. Many of the foundations of plastic deformation of minerals and rocks were established during this period. Also, new experimental techniques were developed, including deformation apparatus for high-pressure and high-temperature conditions, electron micros-copy study of defects in minerals, and the X-ray technique of deformation fabric analysis. The field benefited greatly from materials science concepts of deformation that were introduced, including the models of point defects and their interaction with dislocations. A summary of progress is given by the volume Flow and Fracture of Rocks: The Griggs Volume, published in 1972 by the American Geophysical Union. Since then, the scope of Earth sciences has greatly expanded. Geodynamics became concerned with the Earth's deep interior where seismologists discovered heterogeneities and anisotropy at all scales that were previously thought to be typical of the crust and the upper mantle. Investigations of the solar system documented new mineral phases and rocks far beyond the Earth. Both domains have received a lot of attention from mineralogists (e.g., summarized in MSA's Reviews in Mineralogy, Volume 36, Planetary Materials and Volume 37, Ultra-High Pressure Mineralogy). Most attention was directed towards crystal chemistry and phase relations, yet an understanding of the deformation behavior is essential for interpreting the dynamic geological processes from geological and geophysical observations. This was largely the reason for a rebirth of the study of rock plasticity, leading to new approaches that include experiments at extreme conditions and modeling of deformation behavior based on physical principles. A wide spectrum of communities emerged that need to use information about mineral plasticity, including mineralogy, petrology, structural geology, seismology, geodynamics and engineering. This was the motivation to organize a workshop, in December 2002 in Emeryville, California, to bridge the very diverse disciplines and facilitate communication. This volume written for this workshop should help one to become familiar with a notoriously difficult subject, and the various contributions represent some of the important progress that has been achieved. The spectrum is broad. High-resolution tomographic images of Earth's interior obtained from seismology need to be interpreted on the bases of materials properties to understand their geodynamic significance. Key issues include the influence of deformation on seismic signatures, such as attenuation and anisotropy, and a new generation of experimental and theoretical studies on rock plasticity has contributed to a better understanding. Extensive space exploration has revealed a variety of tectonic styles on planets and their satellites, underlining the uniqueness of the Earth. To understand why plate tectonics is unique to Earth, one needs to understand the physical mechanisms of localization of deformation at various scales and under different physical conditions. Also here important theoretical and experimental studies have been conducted. In both fields, studies on anisotropy and shear localization, large-strain deformation experiments and quantitative modeling are critical, and these have become available only recently. Complicated interplay among chemical reactions (including partial melting) is a key to understand the evolution of Earth. This book contains two chapters on the developments of new techniques of experimental studies: one is large-strain shear deformation (Chapter 1 by Mackwell and Paterson) and another is deformation experiments under ultrahigh pressures (Chapter 2 by Durham et al.). Both technical developments are the results of years of efforts that are opening up new avenues of research along which rich new results are expected to be obtained. Details of physical and chemical processes of deformation in the crust and the upper mantle are much better understood through the combination of well controlled laboratory experiments with observations on "real" rocks deformed in Earth. Chapter 3 by Tullis and Chapter 4 by Hirth address the issues of deformation of crustal rocks and the upper mantle, respectively. In Chapter 5 Kohlstedt reviews the interplay of partial melting and deformation, an important subject in understanding the chemical evolution of Earth. Cordier presents in Chapter 6 an overview of the new results of ultrahigh pressure deformation of deep mantle minerals and discusses microscopic mechanisms controlling the variation of deformation mechanisms with minerals in the deep mantle. Green and Marone review in Chapter 7 the stability of deformation under deep mantle conditions with special reference to phase transformations and their relationship to the origin of intermediate depth and deep-focus earthquakes. 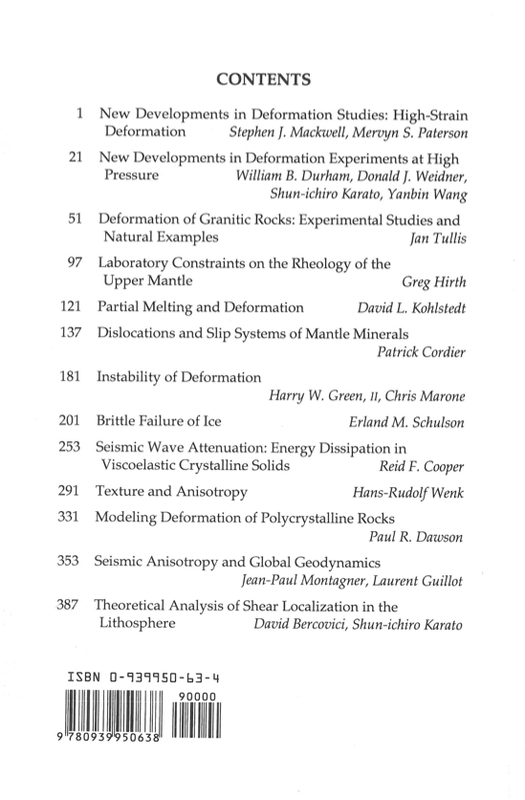 In Chapter 8 Schulson provides a detailed description of fracture mechanisms of ice, including the critical brittle-ductile transition that is relevant not only for glaciology, planetology and engineering, but for structural geology as well. In Chapter 9 Cooper provides a review of experimental and theoretical studies on seismic wave attenuation, which is a critical element in interpreting distribution of seismic wave velocities and attenuation. Chapter 10 by Wenk reviews the relationship between crystal preferred orientation and macroscopic anisotropy, illustrating it with case studies. In Chapter 11 Dawson presents recent progress in poly-crystal plasticity to model the development of anisotropic fabrics both at the microscopic and macroscopic scale. Such studies form the basis for geodynamic interpretation of seismic anisotropy. Finally, in Chapter 12 Montagner and Guillot present a thorough review of seismic anisotropy of the upper mantle covering the vast regions of geodynamic interests, using a global surface wave data set. In Chapter 13 Bercovici and Karato summarize the theoretical aspects of shear localization. All chapters contain extensive reference lists to guide readers to the more specialized literature. Obviously this book does not cover all the areas related to plastic deformation of minerals and rocks. Important topics that are not fully covered in this book include mechanisms of semi-brittle deformation and the interplay between microstructure evolution and deformation at different levels, such as dislocation substructures and grain-size evolution ("self-organization"). However, we hope that this volume provides a good introduction for graduate students in Earth science or materials science as well as the researchers in these areas to enter this multidisciplinary field.